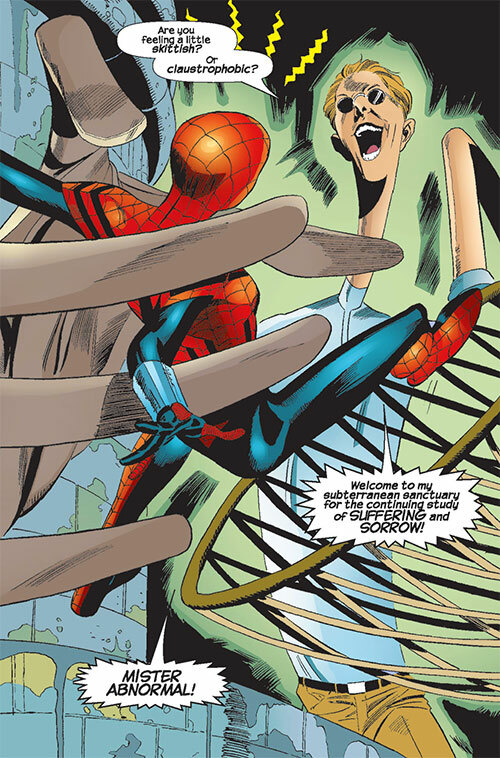 Mr. Abnormal is a pliable perpetrator and enemy of Spider-Girl, who first appeared in 1999. See our Spider-Girl (May Parker) profile for context. Group Affiliation: Former member of the Savage Six, member of Agent Weadon’s team. Base Of Operations: New York area. Eyes: Unrevealed Hair: Light brown. 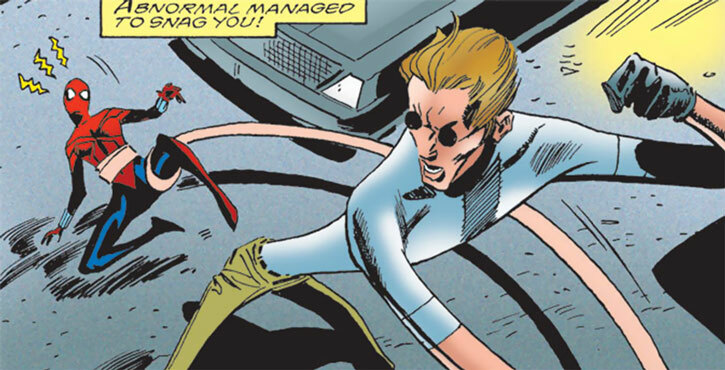 Mister Abnormal can stretch and morph much like Mister Fantastic or the Elongated Man. 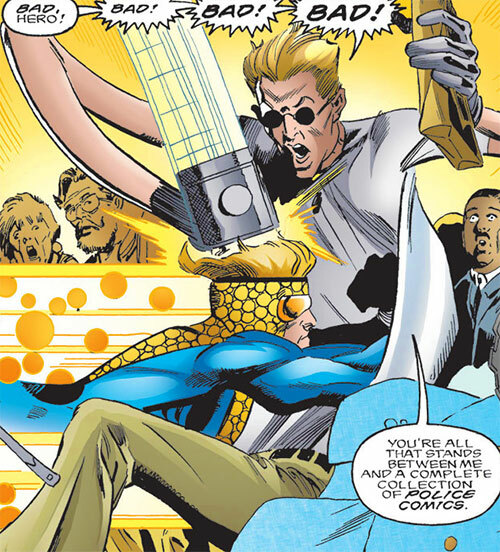 He can also transform his extremities a bit like Plastic Man does. He’s good at deforming his body to avoid or absorb impacts. He is fond of turning his extremities into something special to hit his opponents with. That allows him to hit with superhuman force. Past examples have included hammers, tennis rackets, sledges, boxing gloves, mattocks, elephant feet, mauls and ram heads. Mr. Abnormal has a limited ability to disguise himself as ordinary objects. But he apparently cannot change his colour or the appearance of his head. With these limitations, he’s usually limited to imitating simple background objects such as a lamp post. Thus, he relies on people not really looking at lamp posts. His clothing duplicates the properties of his body. Thus, they can be stretched and deformed without damage. This might be limited to the clothes he was wearing at the time of his accident, though. While sneaking into a toys factory to steal limited edition action figures , an obsessive collector was caught in an accidental spurt of chemicals. These reacted oddly with his body chemistry, and endowed him with stretchy powers. 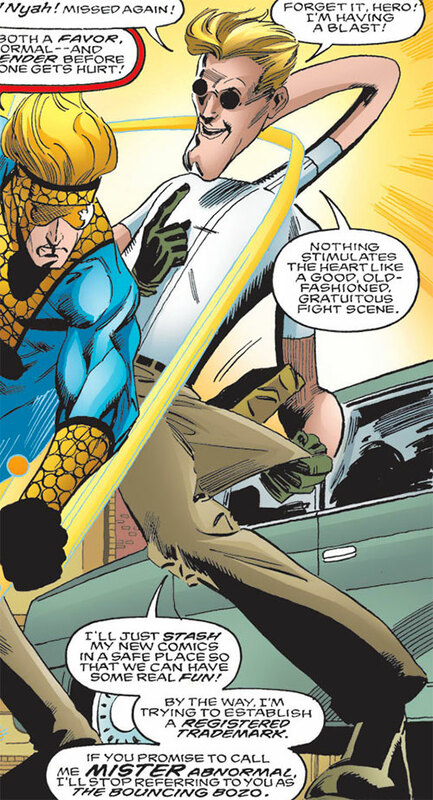 Now calling himself Mr. Abnormal,he stole numerous genre collectibles, but clashed with Speedball (Robbie Baldwin). 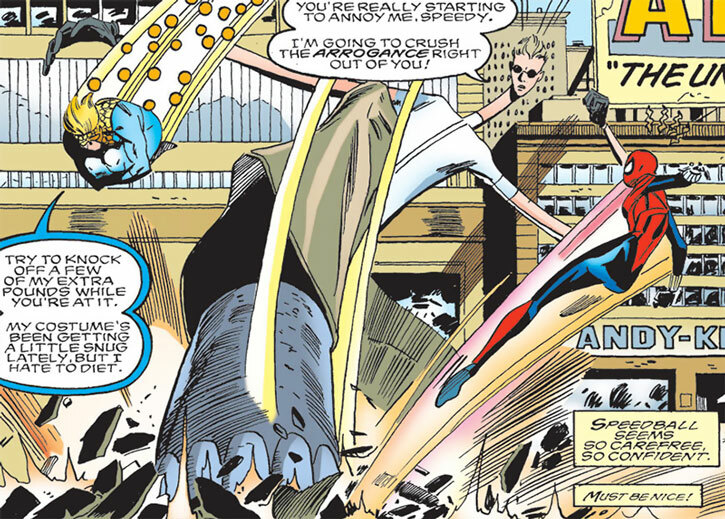 On one occasion, he was defeated by Speedball and Spider-Girl (May “Mayday” Parker). Mister Abnormal was later hired by Funny Face to join his Savage Six. They set up a gauntlet for Spider-Girl to run. Using her speed, Spider-Girl defeated Mister Abnormal as he tried to grab her, tricking him into tying himself into a giant knot. 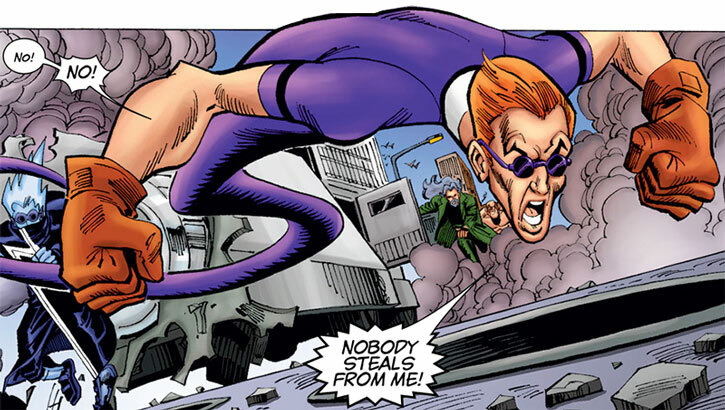 He was then recruited out of prison to join a villains team working for the government under the orders of Agent Weadon. Kaine was their field commander. This team failed to prevent the theft of a capsule holding the Carnage symbiote . It was likewise ineffective when attempting to stop Carnage. Creepy, obsessive, socially maladjusted, sexually inappropriate and attempting to project an image of himself based on fictional characters. He’s chiefly obsessed with collecting comics and toys. But he apparently has come to consider that being a mercenary and buying stuff was better than stealing them. In action, Mr. Abnormal goes for the cheerfully sinister thing. 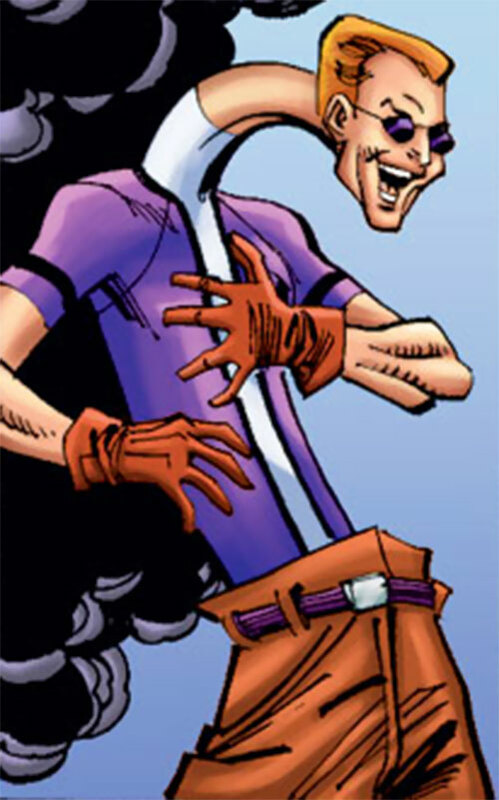 He acts upbeat and bombastic as he tries to kill people. He’s also proud of his ability to plan for encounters, though said plans are actually run-of-the-mill. Chameleon is limited to imitating simple objects, and cannot change the shape or features of his head. Partial Attack Vulnerability (-1CS RV against attacks hitting his head), Partial Attack Vulnerability (-1CS RV against non-concussive energy attacks), SIA toward Nerdy collectables, MIA toward Creepiness. Shades [BODY 01, Shade: 01]. – Enhanced physiology — Enhanced Strength 1, Enhanced Stamina 5, Enhanced Agility 2, Enhanced Fighting 4, Enhanced Fortitude 4 and Enhanced Strength 1 (Limited 1 to grabbing). – Resiliency — Impervious Protection 4 (Limited 1 to Physical Impact), Quirk (doesn’t apply against attacks on his head). – Stretchy body — Elongation 4, Enhanced Parry 6, Enhanced Dodge 6, Improved Hold, Improved Grab. – Morphes limb extremities into big weapons — Strength-based Damage 4, Chokehold, Power Attack, Enhanced Skill (Close combat (Morphes limb extremities…) 4). – Shapechanger — Morph 2 (Objects he can imitate by just stretching and deforming), Limited 1 (Deception Bonus is halved to +10 since he cannot change his facial features). Chokehold, Improved hold, Improved grab, Close Attack 2, Power Attack. Athletics 4 (+6), Deception 1 (+2), Expertise (Nerdy collectives) 5 (+6), Perception 3 (+3), Stealth 3 (+5). Mercenary/Obligations Mr. Abnormal is initially in for the money, though he later becomes a reluctant government agent. Obsession Mr. Abnormal is an avid collector of comics, action figures and the like. Attitude Mr. Abnormal is often creepy toward women. Trade-off areas Attack/Effect PL 10, Dodge/Toughness PL 12, Parry/Toughness PL 12, Fort/Will PL 7. Point total 97. Abilities 12, Defences 12, Skills 8, Powers 63, Devices 0, Advantages 2. Equiv. PL 7. 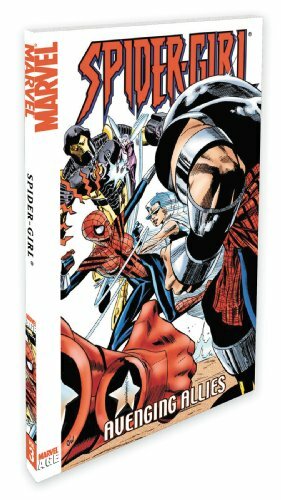 Source of Character: Marvel MC2 continuity. Writeup completed on the 27th of May, 2014.